The Load Sharer T4800 for Conventional Governors provides automatic load sharing and system frequency control for parallel running generators. The load sharing is proportional, meaning that the generators will be loaded equally compared to their individual capacity. 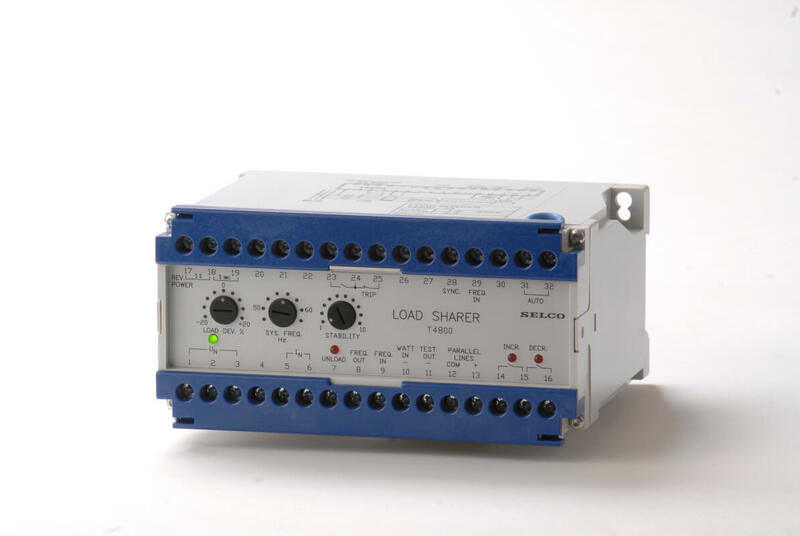 The Load Sharer T4800 is designed to control a generator operating in parallel with the grid, or a generator operating in parallel with other generators (which are also controlled by T4800 units). The T4800 will continuously measure and compare the active current on the generator to an external DC reference signal connected to the “parallel lines” input. The T4800 will increase or decrease the speed of the generator (through the governor) if it finds the active current level to be either too low or two high. Two built-in relays provide the increase and decrease pulses for a conventional governor. The strength (width) of the pulses is proportional to the frequency/phase deviation. The E7800 Motorised Potentiometer can be used to adapt the contact pulses to a signal suitable for the speed trim input of an electronic speed controller.